As part of the Organic Search team at Bloomreach, I work on developing algorithms that enhance the discoverability of products on e-commerce sites. My work involves developing machine learning algorithms for big data that can learn the most relevant and popular searches and similar products to a given product/category. Simulink Design Verifier uses formal methods to statically identify design errors - such as division by zero, overflow and dead logic in Simulink models. Available as an add-on to Simulink, the toolbox can also automatically generate a range of test cases that satisfy a variety of coverage objectives. As part of the Design Verifier team, I added new capability to the toolbox to automatically generate test cases to satisfy relational boundary objectives. The project required a deep understanding of compilers and compiler optimizations, SAT solvers and intermediate frameworks, and involved extensive development (in C++) . This work was one of the major features in the R2014b release. In this work we develop a graph-theoretic framework to isolate botnets in a computer network. Our present a novel approach that depends primarily on the temporal co-occurrences of malicious activities across the computers in a network and can therefore generalize to many different botnet architectures. As practically all aspects of how a botnet manifests itself in a network varies with time--such as the online bot population, bot lifetimes, duration and choice of malicious activities, our approach includes mechanisms that allows our graph based framework to evolve with time. Our results indicate that our framework can isolate botnets in a network under varying conditions with a high degree of accuracy. This work involves finding anomalous events from unlabeled sensor data in smart building environments. We proposed a model for unsupervised learning of multi-modal data using Gaussian Mixture Models with Feature Clustering and Weighting. Our model is easily generalizable to various sensor configurations as there are few heuristics, and almost no manual configuration. This work proposes the use of a sampling-resampling based Bayesian learning technique for learning background and foreground processes in a still camera video. The proposed method is advantageous in the sense that it does not require elaborate numerical integration methods for performing Bayesian learning, and the posteriors are learnt via a resampling based approach. The background subtraction application achieves higher sensitivity and lower false alarm rates as compared to popular existing techniques. Padmini Jaikumar, Abhishek Singh and Suman K. Mitra. Background Subtraction in Videos Using Bayesian Learning with Motion Information. In British Machine Vision Conference (BMVC 2008). Abhishek Singh, Padmini Jaikumar and Suman K. Mitra. A Sampling-Resampling Based Bayesian Learning Approach for Object Tracking. In Indian Conference on Computer Vision, Graphics and Image Processing (ICVGIP 2008). 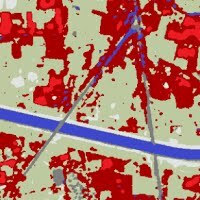 This work presents a technique for segmentation of satellite images using a `sampling-resampling' based Bayesian learning method. The multi-band pixel values of the satellite image are grouped into clusters that are learnt using the resampling based Bayesian approach. Bayesian estimates of model parameters are better regularized, since Bayesian learning yields a complete posterior distribution of model parameters, and not just singleton estimates that are otherwise obtained using frequentist techniques like Maximum Likelihood. Abhishek Singh, Padmini Jaikumar and Suman K. Mitra. Segmentation of Remotely Sensed Images Using Resampling Based Bayesian Learning. In Journal of Pattern Recognition Research, vol. 5, no. 1, pp. 119-130, 2010. Abhishek Singh, Padmini Jaikumar and Suman K. Mitra. A Bayesian Learning Approach for Clustering of Satellite Images. In Indian Conference on Computer Vision, Graphics and Image Processing (ICVGIP 2008).